It's not too late to take advantage of the deals that are part of the Online Extravaganza. There will be more Doorbuster specials tomorrow - if they are as amazing as last week you don't want to miss out. You can check them out at 11pm tonight by clicking here. 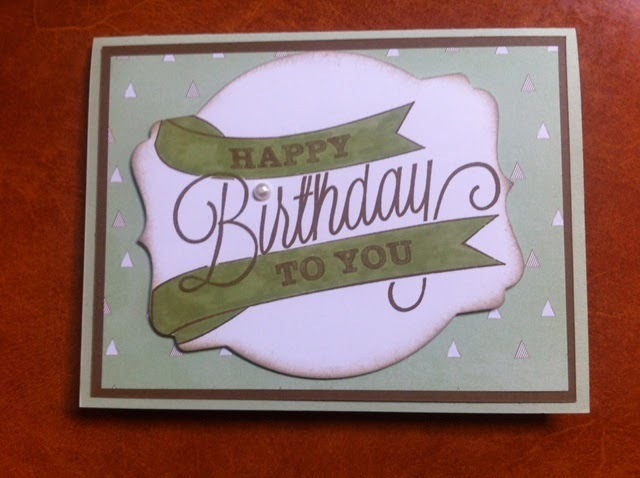 I shared some Birthday cards with you earlier in the week and have more to share. The first card uses one of my favourite colour combinations - Pistachio Pudding and Soft Suede. This was so quick and easy and I really like how it turned out. For the next card I used the Large Polka Dot Embossing folder and ran it through the Big Shot twice. Run it through once and then turn over the paper and move it down slightly to give the two different textures. I love how this turned out. Hope you check out the deals tomorrow. I'll be placing an order on Monday so you can email me if you are interested in taking advantage of the deals!